Wow! A month sure seems to fly by and it's again time for another Wacky Watercooler Blog Hop! This time we are showcasing the new 2015-2016 Annual Catalog. Can you say fantastic! That's just how I feel about the whole thing. I think it's one of the best yet. I have a wish list that's a few miles long. Well, not quite that bad but it's going to break the budget for the next few months. For my projects, I chose three of the new stamp sets. My first project uses the gorgeous Floral Wings stamp set. It's one of the new Hostess sets and it's actually a three-step stamp. I love the way you can add the flowers and leaves to the butterfly. Now how cool is that! I also used the new Bold Butterfly Framelits Dies. 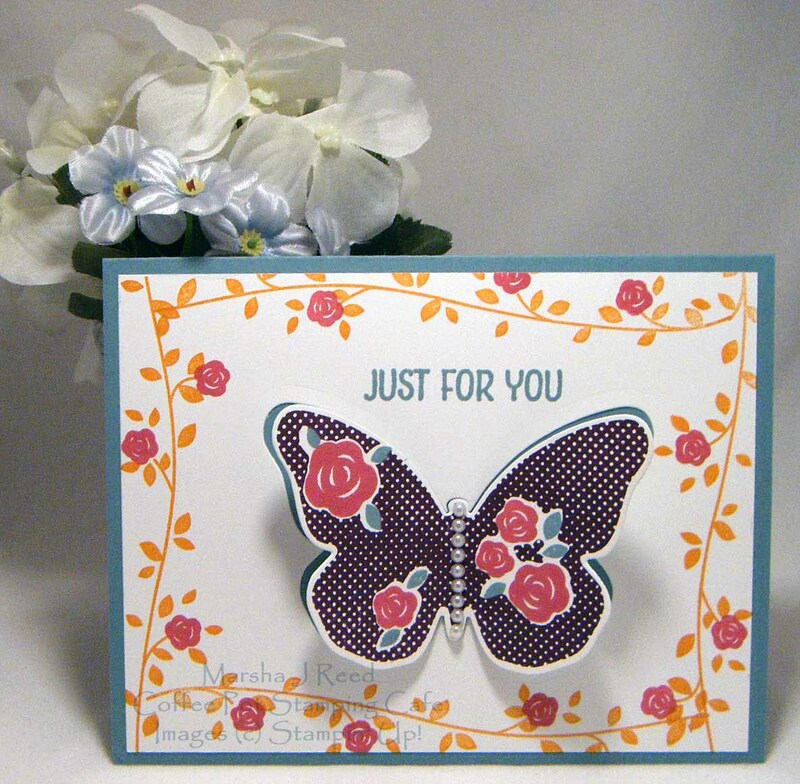 This was a card front I all ready had made so just used the die to cut out the butterfly, adhered the stamped Whisper White layer and added the butterfly using dimensionals. A few pearls and you have a pretty butterfly framed in flowers. My next project is a CASE (Copy And Share Everything) of a card by Claudia Perry. 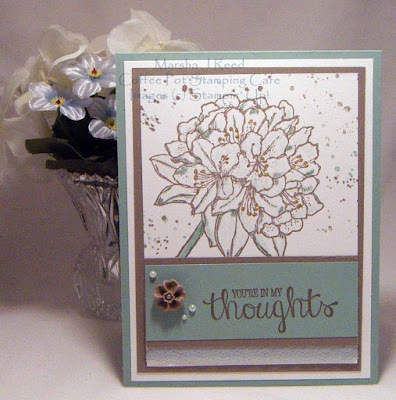 I loved how she used the Best Thoughts stamp set, which is another of our hostess sets, and the new 2015-2017 In Color Blossom Accents. Mine is a bit different in that I switched the way the colors were used but I did stay with the Mint Macaron and Tip Top Taupe colors she used. And, I added one of the tiny pearls to the center of the blossom. You can see her card by clicking on her name. Well, that is it from me and now it's time to move on. Next up is Jackie Susnik. Click the image below to see what wonderful projects she has for you. If you'd like to revisit Heidi Weaver and see her projects again, Click the image below. To go back to the Wacky Watercooler Stamping Blog, click on the image below. All lovely cards Marsha! You've made me look at the Floral Wings set again - love how you cut the butterfly. Thanks so much, Gail! I am loving that Floral Wings set. Thanks so much for leaving a comment, Marie! Marsha, your cards are so fun! Thanks so much for leaving a comment, Kath! Thanks, Priscilla! I agree as Floral Wings has fast become one of my favorites. What great cards Marsha. 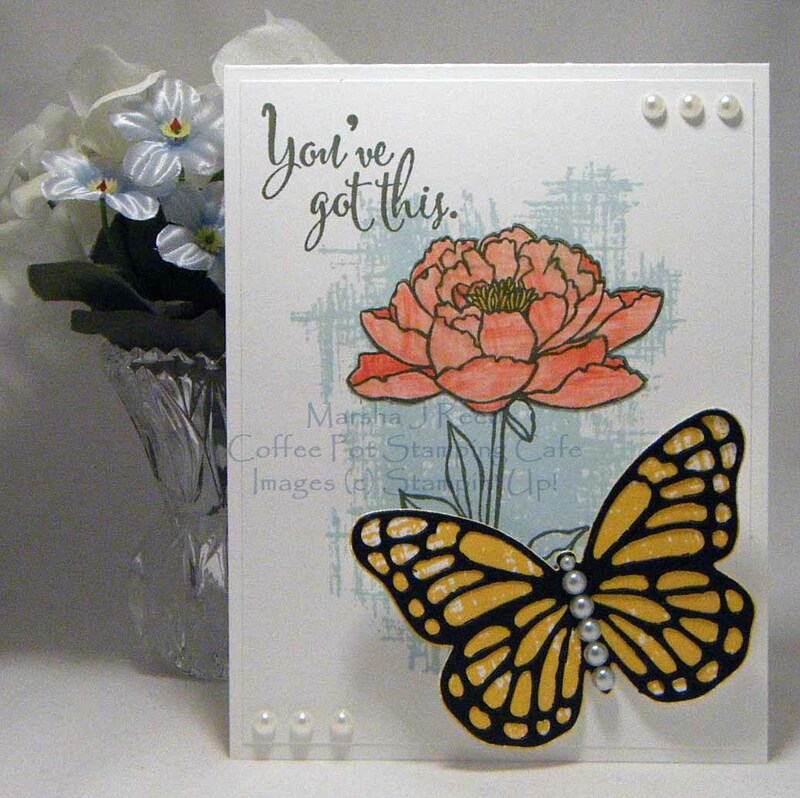 I really love the blend of colours you've used for your first card and the Floral Wings stamp set. It's such a happy card. I can see why you CASED Claudia Perry's card, it's stunning, but so is yours. I like your colour change up. Your third card is one of my favourites of the hop. 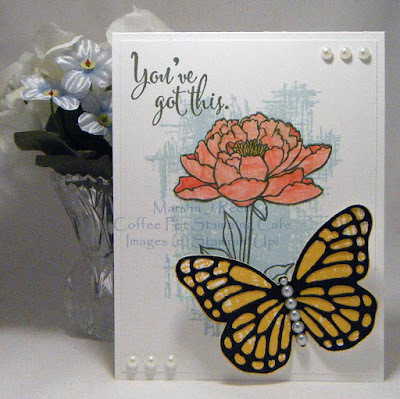 I really like your Monarch Butterfly and how you paired it with the You've Got This stamp set. Thanks, Penny! I really enjoyed creating these cards for our hop. I love your cards, Marsha. Such a beautiful job on all of them. I can actually say I have all of those stamp sets. So now, just go out and play with them. My favorite is your You've Got This card. Thanks, Christine! That was my favorite one, too. I love that stamp set. 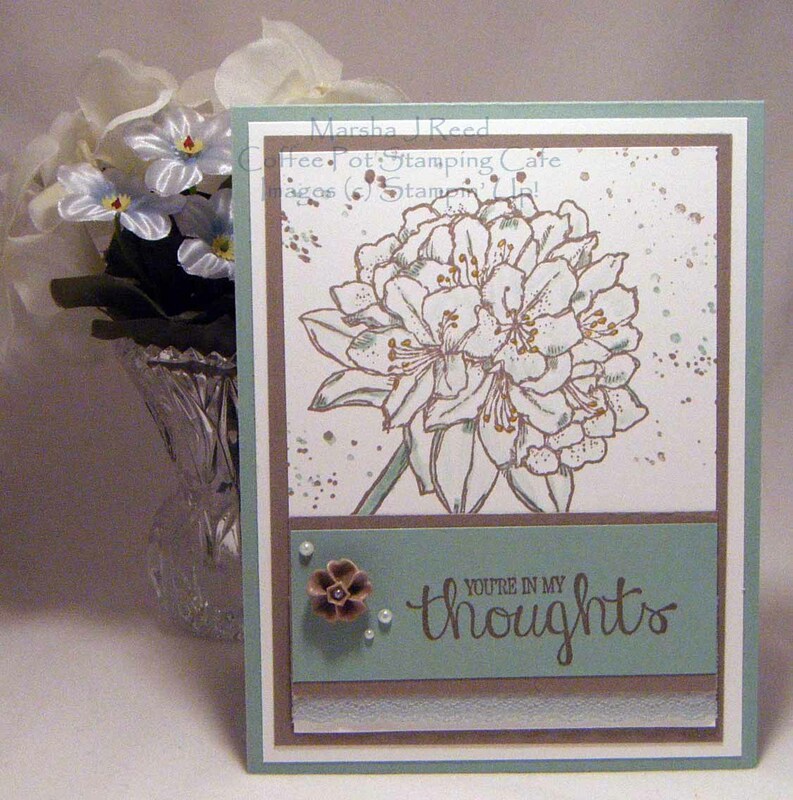 Beautiful cards, Marsha! I love the You've Got This background, too. I was determined not to buy another flower set, but you're weakening my resolve. Thanks so much, Buffy! Glad to know I'm an enabler. I know you'll make some beautiful things with that set. great cards! I love it! Thanks, Terri! You are missed. How's it going for you these days? Love the Best Thoughts card! Didn't buy the set, but really love the look of it. Thanks, Jackie! I've suddenly developed a love for all things flowers and butterflies. Hi Marsha, thanks so much for continuing to be part of our fun Blog Hop. Your Floral Wings card is the first I've really liked with this set. Very elegant. I, too, love the You've Got This set and can see that background being used for so many different projects and with so many different stamp sets. I love the colours you've used in yours, especially the "monarch" butterfly. Until I read that you had used the grid pattern for the Crushed Curry background of the butterfly, I hadn't realized it. What a clever idea! Thanks, Heidi! I really do enjoy our Blog Hops. You never know what you are going to see. I get so many ideas.